Dr. Giddings is a researcher and professor at the University of California at Santa Barbra, specializing in theoretical physics. His current research includes the M-theory of the superstring theory, and what happens to information that is sent into black holes. Giddings primary interest, aside from the mysteries of the universe, is mountain climbing. 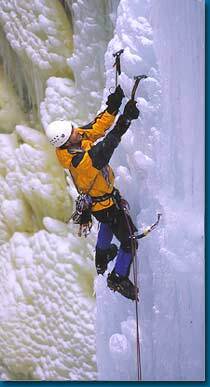 In fact, Dr. Giddings is so into the sport that a photograph of him scaling the Ouray Gorge ice cliff in Colorado appeared in the New York Times. One of the attractive aspects of the sport, to Giddings is the sense of reward. "When you climb a mountain, you can look at it and see that it's quite challenging. But you can put one foot after another and get to the top, usually, and get a feeling of accomplishment at a very visceral level. I think it's good to get this sense of reward, which is more difficult to find in physics." Giddings grew up in Salt Lake City Utah, where his father, who was a chemist, gave him a passion for science and the outdoors. He studied mathematics and physics at the University of Utah, and then went to Princeton to earn a Ph.D. under Ed Witten, one of the leaders in superstring theory.